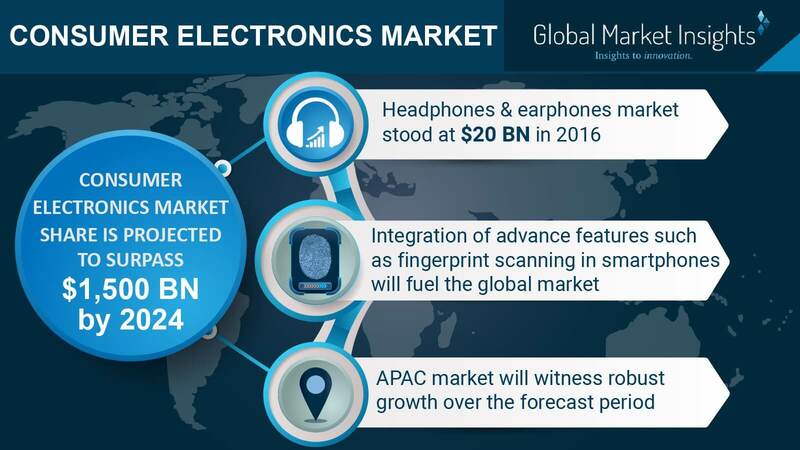 In the last few years, consumer electronics market has undergone a drastic transformation with the robust growth across the entertainment, communication, and information technology sectors. Electronics devices such as smartphones, tablets, and digital televisions have indeed become commonplace in the consumer’s personal & professional lives. Pertaining to the same, companies in consumer electronics market have forged a slew of M&As and strategic partnerships to bring forth customized, user-friendly, and highly advanced electronic goods to the mainstream. Recently, the emerging economies of India and China have even opened doors for major investors in consumer electronics market, given the rising product penetration in these regions. Smartphone and household equipment manufacturers therefore, supported by the initiatives undertaken by regional governments with regards to foreign direct investments (FDI), have been robustly penetrating the consumer electronics industry across these geographies. It is noteworthy to mention that smartphones have been garnering more popularity in a short span than numerous other electronic components that had been launched earlier. Additionally, with the incorporation of next-generation technologies such as artificial intelligence, Internet of Things, augmented reality, and virtual reality, the popularity scale of consumer electronics comprising smartphones, tablet, digital televisions, and cameras has been witnessing lucrative growth. In less than a decade, smartphones have revolutionized the lifestyle of millennials and baby boomers alike. In addition, the involvement of various consumer technology trends in the manufacturing of smartphones have credited limitless application potential. With smartphones becoming more and more indispensable, the competitive scenario in consumer electronics industry has been becoming rather fierce. In order to combat industry challenges and retain their position, companies have been rapidly adopting next-generation technologies. Indeed, a slew of Chinese smartphone manufacturing companies have taken a step ahead of the leading smartphone makers including Apple, Samsung, and Google in this regard. In 2017 for instance, Chinese companies including BBK Electronic Corporation, and Huawei Technologies Co. Ltd. emerged as leading sellers. These companies in fact, accounted more than 20% smartphone sales across the globe collectively. Currently, smartphones have surpassed televisions considering the pace of adoption. Having recognized the potential of the latest electronic components, consumer technology companies have been working toward generating innovative products that would gain ground in the education, healthcare, sports, and automotive sectors. Novel product development, regional business expansion, and diversified design approach adoption have emerged as the go-to options for consumer technology companies that would help them expand their global user base. Enumerated below is a succinct outline of three prominent consumer technology companies that have sustained their stance so far in this industry with the adoption of novel strategies and product development initiatives. The Cupertino headquartered multinational technology company, Apple Inc., is counted amongst the top-rated consumer technology companies. The firm designs, manufactures, and markets consumer electronic products, networking solutions, software, and accessories, and indeed, is renowned for having revolutionized consumer technology trends. With the growing competitiveness and increasing emergence of new players in consumer electronics industry however, Apple seems to have depicted a slightly sluggish growth lately. In this regard, the American multinational company is trying to reach out to many consumers through collaborations, regional expansion, and social activities. For instance, a few days before, the firm inaugurated its first store in Austria and South Korea. With the establishment of regional Apple products stores, the company plans to extend its prominence among remote areas, which may certainly augment consumer technology trends. Apple has also lately been focusing on leveraging the research and educational experience of the academic community. In this regard, the consumer technology company has recently collaborated with the Northwestern University and Chicago Public Schools to offer a technology learning program for teachers. For such training programs, the firm has designed numerous products such as an iPad incorporated with advanced tools and a functional app. This new educational framework and ecosystem of educational applications will help Apple Inc., carve out a lucrative growth map ahead in consumer electronics industry. In the era of digitalization, cybersecurity risks have also been increasing with immense technological advancements. In order to provide a strong security framework to the consumer against cyber threats, Apple is consistently improving its security technology and networking protocols. In fact, it has developed a cyber risk management software for its products including Mac, iPhone, and iPad. This new solution is developed in collaboration with Cisco, Allianz, and Aon. Apple’s initiative demonstrates that combined technology integration approaches of consumer technology companies will help them to capture more business space in the years ahead. Xiaomi is one of the most reputed China consumer electronics industry giants striving to attract more customers by delivering well-designed and high-quality products. With the launch of new and improved smartphones, Xiaomi has been ranked the second phone brand with highest sales across India consumer electronics market in 2017. In order to further enhance its technological expertise, the firm has been teaming up with global technology leaders including Microsoft and Google. In fact, in the first week of March, at the Mobile World Congress 2018, Xiaomi signed a deal with Google for implementing the Google Assistant and AR platform in its smartphones. The deployment of augmented reality in mobile devices will also enable Xiaomi to bring about major changes in consumer technology trends. Considering the ongoing popularity of smartphones, Xiaomi is looking forward to incorporating AI, cloud computing, and big data features in its upcoming smartphones. The recent partnership with Microsoft regarding various technology skillsets is one of Xiaomi’s strategic initiatives to accelerate its pace in consumer electronics industry. in fact, this partnership will allow the Chinese consumer technology company to tap a wider user base for its next-generation products. With the assistance of Microsoft’s AI and cloud computing technologies, Xiaomi is expected to successfully accelerate its international expansion and strengthen its leadership in consumer electronics industry. In 2017, Xiaomi took a major step with its first expansion across Western Europe. It has now launched two new smartphone brands in Spain. Other than its own e-commerce site, it has also collaborated with AliExpress and Ingram Micro to distribute a versatile range of products in Spain. By launching next-generation smartphones across several geographies, this Chinese consumer electronics company plans to emerge as a one of the pioneers of the current mobile industry. One of the many acclaimed consumer technology companies, this South Korean multinational conglomerate is endowed with immense technological expertise and is planning to develop a wide range of LED solutions and semiconductors. The company has developed an image sensor, which will enable its latest mobiles to improve imaging and video functionality. In addition, it has been continuously reinforcing new features for enhanced security, appearance, touch command management, and power. With enhanced semiconductor and LED technology, it will raise the energy efficiency, functionality, capacity, and performance of its mobile devices. Recently, Samsung launched two new smartphones comprising revolutionary optical sensors, which will provide feedback about the user’s health and well-being. In order to utilize these sensors, it has collaborated with UCSF (University of California, San Francisco). The built-in optical sensor will help to measure blood pressure directly via smartphone without any external assistance of hardware. The development of such smartphone-enabled health monitoring facilities will help Samsung further strengthen its stance in consumer electronics industry. Amidst the backdrop of the current scenario, it is essential that consumer technology companies continue to adopt novel growth tactics that will help them to acquire a major share of the overall revenue. Next-gen technologies such as AI, IoT, and cloud computing are rampant in this business space, as companies attempt to strengthen their position in consumer electronics market. As consumer preferences undergo a paradigm shift with the digital transformation spanning the globe, consumer technology trends are likely to witness an altering change. In consequence, this would have a commendable impact on consumer electronics market size, poised to generate more than USD 1,500 billion by the end of 2024.